Dehydroepiandrosterone (DHEA) can be measured with radioimmunoassay, liquid chromatography–mass spectrometry (LC-MS), or chemiluminescent techniques, and the reference range varies by the technique used. The reference ranges for DHEA concentrations measured with LC-MS are listed in Table 1. The image below depicts the molecular structure of DHEA. Ball-and-stick model of the dehydroepiandrosterone molecule. Image courtesy of Wikimedia Commons. Serum dehydroepiandrosterone (DHEA) concentrations peak around the third decade of life and then drop with age. The serum DHEA level has a circadian variation and may vary during the menstrual cycle; therefore, dehydroepiandrosterone sulfate (DHEA-S) seems a better marker in clinical practice because it has a longer half-life with no circadian variation. In congenital adrenal hyperplasia (CAH), the DHEA level varies with the type of the enzymatic deficiency. DHEA levels are normal when CAH is caused by aldosterone synthase deficiency. 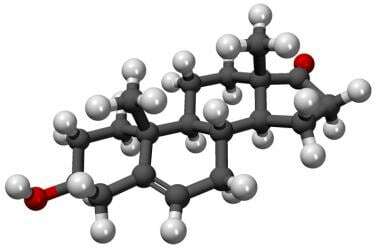 Dehydroepiandrosterone (DHEA) is a C-19 (19 carbon atoms) steroid hormone and one of three androgens (DHEA, DHEA-S, androstenedione) secreted by the adrenal gland. It is a biologically inert hormone produced from cholesterol in the zona reticularis with a rate of about 8 mg per day. DHEA is transformed by DHEA sulfotransferase (SULT2A1) to DHEA-S, whereas steroid sulfatase can convert DHEA-S back to DHEA, possibly making DHEA-S function as a circulating storage pool. Later, DHEA is converted in the peripheral tissues to more active androgen (testosterone a dihydrotestosterone) or estrogen. Serum DHEA concentrations decrease after birth and then begin to increase at around age 7-9 years (adrenarche) and continue increasing until the third decade of life. They then start to drop; by age 80 years, the concentration is about 20% of that at age 25 years. An abnormal DHEA level is not considered diagnostic of any disease, and it should be always measured in conjunction with other hormones. The DHEA level can be decreased in anorexia nervosa and illness. DHEA levels increase in association with smoking. DHEA can be used illegally to improve athletic performance, but the NCAA, WADA, and other sports-governing agencies prohibit the use of DHEA. Archer DF. Dehydroepiandrosterone Intra Vaginal Administration for the Management of Postmenopausal Vulvovaginal Atrophy. J Steroid Biochem Mol Biol. 2014 Sep 5. [Medline]. Büttler RM, Martens F, Kushnir MM, Ackermans MT, Blankenstein MA, Heijboer AC. Simultaneous measurement of testosterone, androstenedione and dehydroepiandrosterone (DHEA) in serum and plasma using Isotope-Dilution 2-Dimension Ultra High Performance Liquid-Chromatography Tandem Mass Spectrometry (ID-LC-MS/MS). Clin Chim Acta. 2014 Aug 27. 438C:157-159. [Medline]. Vitlic A, Khanfer R, Lord JM, Carroll D, Phillips AC. Bereavement reduces neutrophil oxidative burst only in older adults: role of the HPA axis and immunesenescence. Immun Ageing. 2014. 11:13. [Medline]. [Full Text]. Bulum SE Melmed. Williams Textbook of Endocrinology. Physiology and Pathology of the Female Reproductive Axis. 12th ed. Philadelphia, PA Saunders Company; 2011. chap 17. Cunningham SK, McKenna TJ. Dissociation of adrenal androgen and cortisol secretion in Cushing's syndrome. Clin Endocrinol (Oxf). 1994 Dec. 41(6):795-800. [Medline]. Evaluation of endocrine function. Guber HA, Farag AF. McPherson: Henry's Clinical Diagnosis and Management by Laboratory Methods. 22 nd ed. Philadelphia, Pa. Saunders Company; 2011. chap 24. Kroboth PD, Salek FS, Pittenger AL, Fabian TJ, Frye RF. DHEA and DHEA-S: a review. J Clin Pharmacol. 1999 Apr. 39(4):327-48. [Medline]. Kushnir MM, Blamires T, Rockwood AL, Roberts WL, Yue B, Erdogan E. Liquid chromatography-tandem mass spectrometry assay for androstenedione, dehydroepiandrosterone, and testosterone with pediatric and adult reference intervals. Clin Chem. 2010 Jul. 56(7):1138-47. [Medline]. Stewart PM, Krone NP. Melmed: Williams Textbook of Endocrinology. The Adrenal Cortex. 12th ed. Philadelphia, PA Saunders Company; 2011. chap 15. Disclosure: Received income in an amount equal to or greater than $250 from: Corcept and Novo-nordisk .